The JJ factory was born out of the ashes of the former Tesla factory. They currently make a range of High quality valves based on some of Tesla most famous designs. 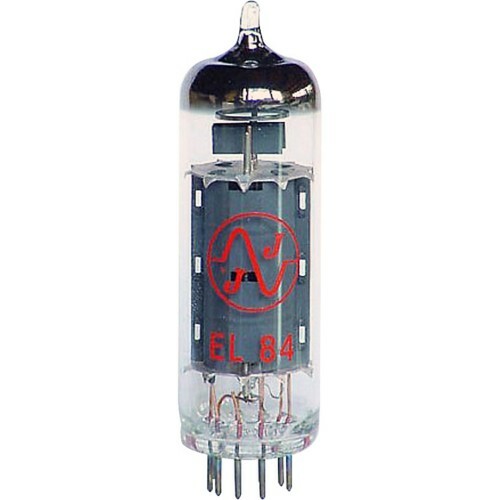 The JJ-Tesla EL84 has many of the original Philips design features and produce an excellent sounding EL84. Sonically the JJ also provides excellent performance in all guitar amplifier applications.The JJ closely follows the traditional sounding Philips, Amperex and Tungsram designs which make this a very popular valve. In clean playing application the JJ EL84 produces a smooth and immensely warm sound. The midrange is full and well balanced with a tight and well defined bass end. In overdriven mode the JJ EL84 is very easy to overdrive providing a warm and natural distortion overdrive with a little compression. The JJ EL84 has been a favourite of mine since its introduction to the market hence we buy a large quantity of these to ensure you get the best price.